Structure-borne noise is a growing problem for multi-occupancy buildings – but there are ways to reduce it, says Lee Nichols, ‎product development & business manager at Monarfloor Acoustics, part of the BMI Group. According to the World Health Organisation, noise is an ‘underestimated threat’. It can lead to multiple health problems from sleep deprivation to stress, poor mental performance and even heart problems. In the UK the number of complaints due to noise nuisance in domestic buildings is constantly growing. As the number of multiple-occupancy dwellings, such as purpose-built apartments or converted buildings, increases so too do the risks of unwanted noise. One of the biggest problem areas – and one of the least well-understood – is flanking sound. Flanking sound doesn’t travel directly from one space to another. It’s noise that takes an indirect path, perhaps through the structural frame of a building, or through voids beneath floors or within walls. It could be the sound of a barking dog, dancing feet or a humming hoover that travel from one part of a building to another and cause annoyance. Unfortunately, the section of our Building Regulations that deals with noise, Part E, has not been updated for residential buildings since 2004. Meanwhile, music and home entertainment systems have changed beyond all recognition. Generally, more mass reduces flanking transmission problems. A traditional concrete floor with masonry walls would be the ideal choice from a noise transmission perspective. Adding mass in other ways, such as using denser blockwork or thicker floor slabs, always helps. However, this can be difficult in lighter forms of construction and ‘off-site’ such as steel-framed or timber-framed buildings. Designers need to take extra care when using modern methods of construction. Sound travels through structures when a structural element continues from one property to an adjacent one. It could be a continuous floor slab, a joist, a void beneath the floor or ceiling or the cavity inside a wall. To stop sound travelling, one must somehow break up those continuous elements. For example, the traditional way to isolate adjacent semi-detached or terraced houses is to split the floor slab at the point of the party wall. In many cases, that isn’t a good option because it adds cost in additional foundations to support the edges of the slab and more material to excavate. 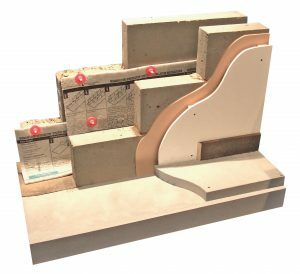 In that situation, a proprietary acoustic Isolation system for party walls, such as Bridgestop, can lead to savings of between 14 per cent and 35 per cent of foundation costs. Bridgestop incorporates an insulating membrane that goes on top of the floor slab, underneath the party walls, and a quilt that is installed on the cavity-side of one of the party walls. Savings are most pronounced on brownfield sites where there is the additional cost of removing contaminated land. Where there is a gas or radon barrier, a proprietary acoustic isolation system can protect the barrier from potential damage due to mortar droppings. From a sound engineer’s perspective, the best approach to joints would be to de-couple them – if it’s possible. Often it isn’t. Some forms of offsite offer particular problems, for example when steel-framed ‘pods’ are bolted together the joints between elements are creating a ready-made path for sound to flow through. 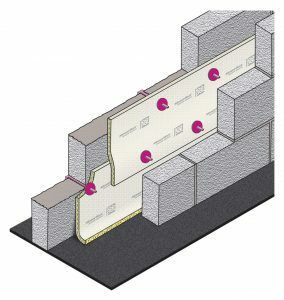 One solution to isolate the joints between walls and floors is an elastomeric interlayer, such as Monarfloor Wall Cap. This interlayer sits over the top of a load-bearing wall, below the floor slab above it. Pre-completion sound insulation testing has demonstrated improvements of 8dB and more using this cost-effective and easy-to-install method – which is a very significant improvement in performance. Mechanical and electrical installations can often be the source of flanking noise in residential buildings – think banging water pipes or grumbling shower pumps. In recent years, the drive towards higher levels of energy efficiency and air-tightness means that mechanical ventilation and heat recovery systems are being installed more often. To avoid such installations becoming a problem, it’s important to choose low-noise units and ensure that they are resiliently mounted to avoid vibration and noise. Risers too must be firmly fixed. Another way to protect against flanking transmission is to install independent linings within a room or apartment. This may be a viable solution for a retrofit or conversion, although the downsides are that it adds significant cost and reduces the rentable or saleable space. Acoustic floors reduce both impact and flanking sound transmission and are already a common solution. 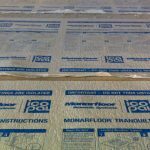 Products such as Monarfloor Tranquilt can be used as an isolation layer between the sub-floor and the finished screed. We are seeing more demand for these systems, such as Monarfloor Wall Cap and Monarfloor Tranquilt, for high end attached dwelling, and buildings such as hotels, retirement complexes and build-to-rent apartment blocks. For some architects and specifiers, the fact that they are made from fully-recycled material is an extra bonus. In conclusion, there are cost-effective and straight-forward ways to reduce flanking transmission and hence greatly improve the environment for those living in or using the building. For new buildings, it is very important to design these measures in early, since retrofitting systems to reduce flanking transmission is expensive and often ineffective. Next : Do Builders Charge Extra to Clients With “Posh” Names?